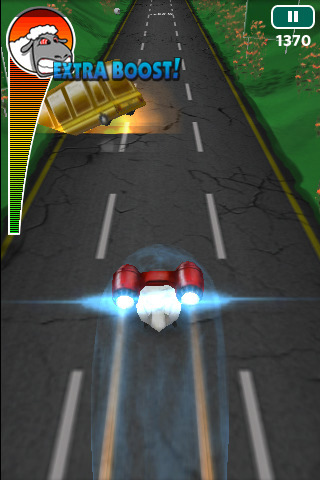 Rocket Sheep Rampage is an iPhone, iPod, and iPad app that has the player control a cute rocket powered sheep as it races down a freeway filled with obstacles and bombers to rack in a high score on Openfeint. Ok, Seriously? How awesome does that sound!? This whole app screams fun. The introduction of ‘You are now entering the Dumpling Dimension’ really sets the mood of the rest of the game. From the main menu to the basic tutorial, everything had a tongue-and-cheek lighthearted feel. The art is bright and clean, the sounds are fun and strangely appropriate, and the tutorial was fast and allowed me to get straight into the gameplay. The player’s interface is just three lanes of traffic. You tap the left, middle, or right lanes to steer your sheep. That’s all there is to this game. As you gain speed, you must evade vehicles, dodge slow-down tracks, and skirt past a stealth bomber as it tries to blow you up. Yes, a stealth bomber. The 3D is bright and gradient-shaded to give everything some depth and roundness rather than flat boxes with color. It’s simple and most of it blends together while you rocket past explosions, cars, and hazards. My favorite part of this game is the Rampage mode. It changes the game play after you hit max speed and is hilariously fun. You ram cars and try to pile them up air-juggle style to gather extra points that will improve your Openfeint score. It’s ridiculous, it’s fast, and paces the game so that you don’t get overwhelmed from just dodging death traps. Smaller touches add a lot to this game. When I just narrowly squeezed between two vehicles and got out safely, it gives you a small ‘phew!’ Batman-style caption on screen. It’s small touches like that that make me feel good for accomplishing something so risky. There is surprisingly little to complain about for this game. It lacks substance such as storylines or characters, but the simplicity of this game makes it fun. The developers at Dumpling Dimension weren’t going out to make an RPG or adventure game. They set out to make a game about a Sheep strapped to a rocket that destroys LA traffic. A personal fantasy of most drivers (including myself). This game was really fun, fast, addictive, and had just enough challenge to allow for the player to improve subtly with each playing. If you have a few minutes to burn or if you are riding the bus home for half an hour, this is a great way to have some fun and enjoy the mayhem. Oh, and if you are riding shotgun in the middle of rush-hour traffic, then this is also a great way to rampage out some of your frustrations. AppSafari review of Rocket Sheep Rampage was written by Joseph Ho on July 29th, 2010 and categorized under Action, App Store, Featured, Games, Universal. Page viewed 3832 times, 3 so far today. Need help on using these apps? Please read the Help Page.